Entire books are written on the subjects of acquisition and retention for both charities and membership associations. Yet we all can benefit from a few reminders from time to time. That’s what I have for you today – a few reminders. And in my opinion everything related to acquisition and retention is all part of one over-arching fundamental: Everything you do is cultivation and stewardship. Everything. Your first direct mail letter or email to a prospect is as much cultivation as it is acquisition. I firmly believe keeping this in mind will “warm up” all of your marketing and fundraising messages to your supporters. What’s more, I believe this mindset will have a positive impact on both your acquisition and retention numbers. Be oh so kind to your readers. Nurture them every step of the way. 1. You might generate more income if you send out newsletters and other informational mailings. Don’t wear out your donors and members by asking for money every single time they hear from you. Test this. 2. Is the following true for your nonprofit as well? Those organizations that send out membership renewals, have annual giving clubs, and do some form of annual report to have higher retention and higher overall income. 3. Don’t be afraid to send a longer letter – 4 pages – for acquisition. At least test it with a large enough sample size! Test the short letter against the longer one. There’s a lot to cover in acquisition. That’s why it’s incredibly difficult to make your case in one or two pages … to make a “good” case, that is. Don’t assume short works best without adequate testing. 4. Never stop acquiring new donors or members – regardless of your budget or the economy. 5. Send out multiple acquisition mailings per year. Rule of thumb starting points are at least three; but try for four or five. 6. 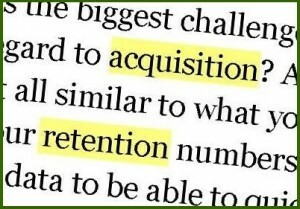 If acquisition and retention numbers are down, consider investing more to acquire and retain them. It can be a death spiral if you keep cutting the budget in these areas. Your database could easily wither away within as little as five years. 7. Increase the attention you give new donors and members. Show deeper and more heartfelt gratitude for their support. Beef up your cultivation and stewardship efforts. 8. Are you tracking what percentage of new donors make a second gift? Keep tweaking and testing to get this as high as possible for YOUR nonprofit. 9. Are you tracking what renewal approach works best to get a second gift? Or to get members to renew at the end of their first year of membership? Keep tweaking and testing to get this as high as possible for YOUR nonprofit. 10. Do you only ask for that second gift one time? Or multiple times? Hopefully it’s multiple times; anywhere from three to six is common. Similar for membership renewals. 11. Have you tested telemarketing for lapsed donors? This is often a most effective strategy. 12. Say thank you promptly and lavishly. 13. Keep supporters informed of the achievements they’re helping make possible. Do this in appeal letters, newsletters, emails, and everywhere you can. Again, everything you do is cultivation and retention. Whenever you read ideas about these subjects think about how those ideas will help your acquisition and retention. And test, test, test. Just because something works great for another nonprofit doesn’t mean it will perform the same for your charity or association. What tips can you add to the list? Please share in the comment box below.